Todd walks in and says "Should we deal with this other thing now?" To which Walt replied: "Yeah". He puts on his glasses and as he leaves the frame, the shot focuses on the poster depicting various flies on the wall behind him. Is there any significance or symbolism behind this shot? 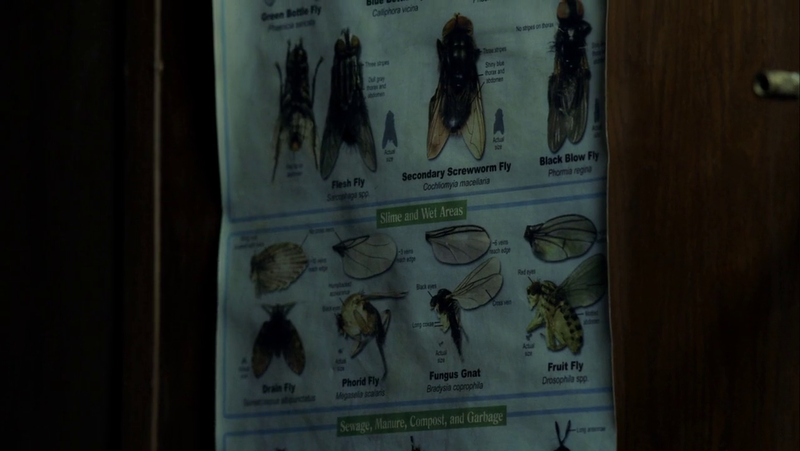 Flies were a common insect that appeared in Breaking Bad. It has been speculated that the fly represents guilt, contamination, irrational obsession, and the loss of control in Walter White's life. In this case, it would represent his shooting of Mike. If you haven't completed the entire series yet, I won't give up the ending but I will tell you to notice the use of the fly in the very last episode. By the way it's "Gliding Over All" and as far as I can tell, the fly is a recurring symbol primarily of Walt's guilt (starting in the episode "The Fly" and his guilt related to Jane's death), in addition to other things like contamination / inability to control everything as mentioned in that Breaking Bad Wiki link above. Not the answer you're looking for? Browse other questions tagged analysis breaking-bad . What is the meaning behind the silent dream scene in Battle Royale? Is there significance behind the spider visions in Enemy? Is there any symbolism behind the bunny face? Any reason behind the ending of Inglourious Basterds? What is the meaning of the final scene of the first season of “House of Cards”? Is there a meaning behind the dripping sink at the end of the movie? Is there a symbolic meaning behind the Spiral Hill in The Nightmare Before Christmas? Is there a hidden meaning behind 'Smoke On The Water' in Better Call Saul?